Researchers from UCLA and Washington University in St. Louis have discovered the previously unknown mechanism of how proteins from Plasmodium parasites — which cause malaria — are exported into human red blood cells, a process that is vital for parasites to survive in humans. The finding could pave the way for new treatments for malaria. In the study, published today in Nature, researchers reveal the atomic structure of the Plasmodium translocon of exported proteins, or PTEX, the protein complex that transports these malaria proteins into the red blood cell. 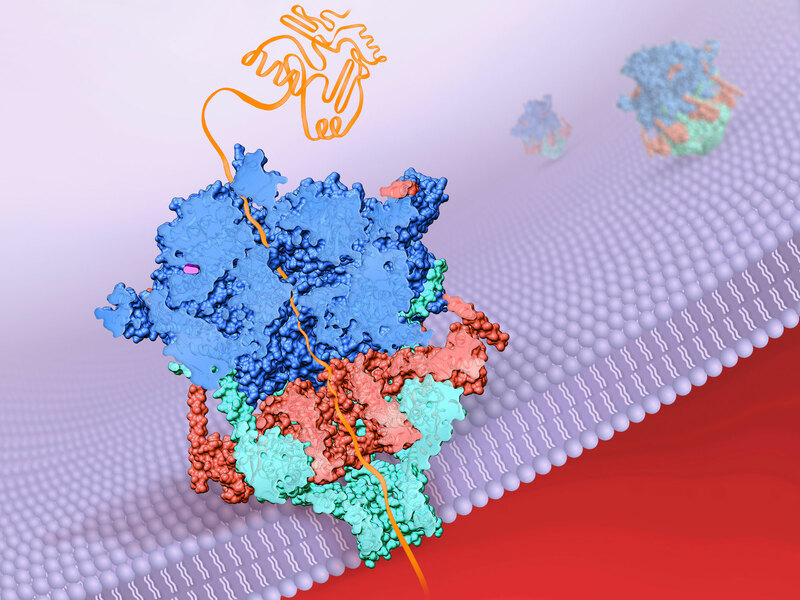 The research also provides the first direct evidence of the proteins moving through PTEX. Malaria is an infectious disease transmitted to people through the bites of infected mosquitos. It affects more than 200 million people annually, causing nearly a half-million deaths each year. When a human is bitten, Plasmodium parasites invade human red blood cells and take a part of the red blood cell membrane to build a protective compartment, or vacuole, around itself. PTEX acts as a gatekeeper; without it, effector proteins become trapped in the vacuole. Ho and her colleagues wanted to learn exactly how PTEX is involved in transporting the proteins out into the red blood cell. To find out, the Washington University researchers first grew malarial parasites in human blood in a laboratory. At UCLA, Ho extracted PTEX from the parasites, and rapidly froze them at 190 degrees below zero Celsius. From there, she took images of the PTEX particles using a method called cryoelectron microscopy, or cryoEM. In the technique, scientists use an electron microscope to hit the subject — in this case, PTEX particles — with an electron beam, and capture the resulting 2D images with a specialized camera. Ho then used computer algorithms to combine the 2D images into high-resolution 3D models, giving the team the first-ever view of the entire shape of PTEX at an atomic level. They discovered that PTEX is made up of three proteins that act like a molecular machine. In looking closely at the 3D models, the team made an even more exciting discovery. With the ongoing race against the rise of drug-resistant malaria parasites, the scientists hope that their findings could help drive the development of urgently needed new drugs that target PTEX and prevent it from functioning properly. For Zhou, finding new treatments for malaria is a very personal mission. The study’s other authors are Josh Beck and Daniel Goldberg of Washington University and Mason Lai and Yanxiang Cui of UCLA. Zhou and Egea are also members of the UCLA Molecular Biology Institute. The research was supported by the National Institutes of Health, the Ruth L. Kirschstein National Research Service Award, the National Science Foundation and the Alexander and Renée Kolin Endowment at UCLA. Be the first to comment on "Scientists Reveal Mechanism That Helps Malaria Parasites Take Over Blood Cells"